Click on this link if you need more information about Fibre optic sensors. 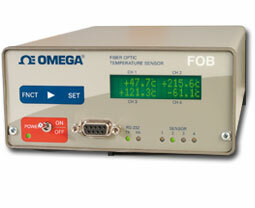 The FOB100 Series comprises high-accuracy, multipurpose fiber optic thermometers with 1, 2, or 4 channels. They use an original algorithm to analyze incoming signals, measuring the temperature on each channel. The standard analog output is 0 to 10 V; 4 to 20 mA is optional. Sensors are sold separately in various cable lengths (see “To Order” chart), are interchangeable, and do not require calibration. With the optional FOB100-SOFT software for Windows (see “Accessories”), the user can download data to a PC via the RS232 communications port on the front panel. Software features include min/max alarm; full data logging functions; and bar-graph, trend-line, or statistics display. The FOB100’s rugged enclosure and immunity to EMI/RFI interference make it ideal for demanding industrial and laboratory applications. Nota: * Add number of meters. Each additional meter over 2, add $15 per meter. ** Maximum available length is 30 m (98'). Comes with complete operator's manual, NIST certificate, and 120 to 240 Vac, 50/60 Hz power supply. To change the 0 to 10 V output to a 4 to 20 mA output, add “-PV” to the model number, no additional charge. For corrosive environments, add “-PTFE” to the model number and add $50 to price.